My eighth and final week in Tenerife has been full of bittersweet feelings. On one hand I cannot wait to head back home, but on the other hand I am going to miss the people, places, and especially the diving! We had the chance to deep dive Tabaiba for the last time. We had planned to dive at night at Tabaiba to complete one of our favorite customers, Lewis, PADI advanced open water course. Unfortunately the current at the dive sight was too strong so we had to cancel the night dive. Outside of the dive shop, we had time this weekend to soak up the sun at one of our favorite beaches in El Medano. When we arrived at the beach, the water was completely filled with kite surfers and large waves. It was so much fun trying to body surf in the waves while avoiding being run over by all the surfers. After the beach session we walked to Flashpoint where we devoured the best cheeseburgers we have found on the island. It is a sad feeling having to pack up all my dive equipment. I know when I get home I will have a few more months of diving, but the water there does not compare to the water we have been spoiled to dive in for the past two months. The time has flown by, every dive and every person I have met here will leave a lasting memory. I would recommend this internship to any water lover who wishes to enjoy eight weeks of fun, sun, and excellent diving! Posted in: Blogs, Dive and Sea Teneife, PADI Divemaster Intern Blogs, PADI Divemaster Interns. Tagged: Divemaster, Diving, Diving Tenerife, PADI DIvemaster, PADI Divemaster internship Tenerife. 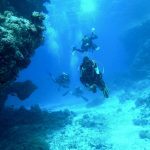 ‹ Scuba Diving – Learning a new language!